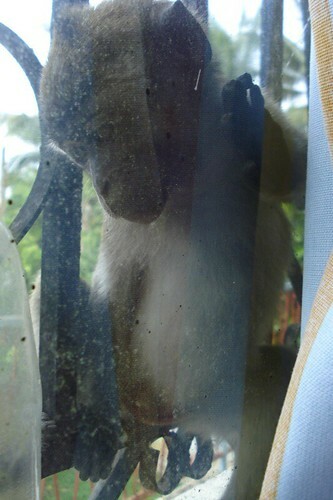 I was just publishing the Official Dinner post when suddenly I heard funny sounds on my bedroom window! Look who’s there! Heheheheheheheeheh!!! So cute! It’s peeking into my… watering bottle! (I have a little plant on my window sill). 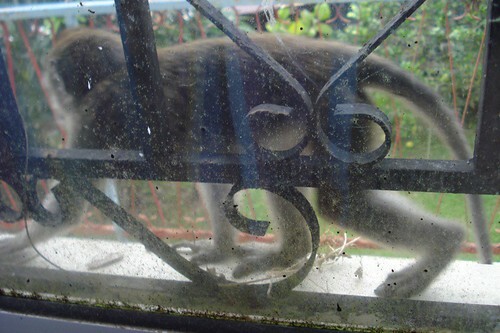 Sorry the picture is a bit blurry, there’s reflection from my curtains and my window is not exactly clean on the outside. Hehehe. SO CUTE! Now THIS is why people get cameras. Hehe. I’ll give it a name later. Any suggestions? Next Post → YL at GUESS WHERE? hahaa.. Nah! kedapatan mengasuh ambuk!! hahaha.. How about you calling him BOBO?? 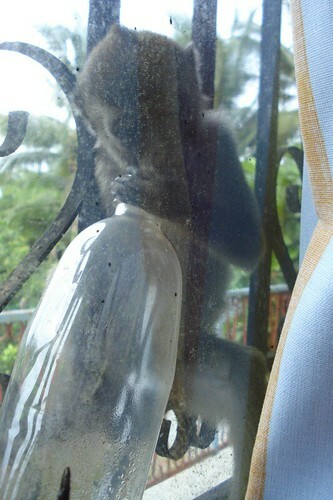 BOBO THE MONKEY! ME likes it. I’m gonna modify it jadi.. ABOBO. Because it’s funnier and more nonsensical hehehehehehe. Also because the monkey ada mohawk. Heheheheh irrelevant. Also pasal the monkey in Alladin (my fav. Disney cartoon) namanya ABU. Anyway, I’ve placed a lil banana outside with a bowl of water. Now banana is gone. Hehehe. Don’t know when he took it.